I spent the past two days baking and making candy. I haven't been able to do any stamping, but I found a recipe on Pinterest that's the BOMB! 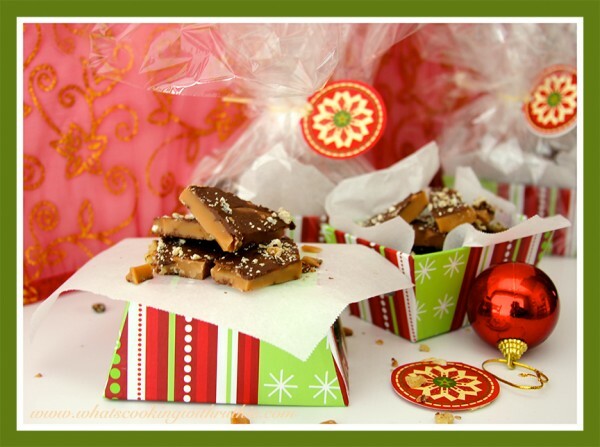 I adore Heath Candy Bars and this English Toffee recipe tastes just like them...only better. I was reluctant at first, I normally shy away from recipes that require a candy thermometer, but I just had to try this one. It was so easy and took a little patience waiting for the toffee to reach 300 degrees, but it was soooo worth it. I'm going package the majority for gifts, otherwise I'll eat it all myself. I used a jelly roll pan, which is a little bigger than a normal cookie sheet, so I added more chocolate and nuts. I used 12 oz. of chocolate candy coating instead of the Hershey Bar and grated it with my cheese grater. Separate remaining chocolate into squares and set on toffee, when it starts to melt push the chocolate around with a knife until completely melted, and spread evenly over toffee. If your still needing gifts for Christmas, I have 13 new stamp sets for sale that could arrive in time for Christmas. To view items, click here. Plus, over 300 new Clearance Rack items have been added to the Online Store at discounts up to 80 percent off retail! Savings up to 80% on card stock, punches, ink pads, STAMPS, and more! These items won't last long, so click here to check out what's new on the clearance rack! 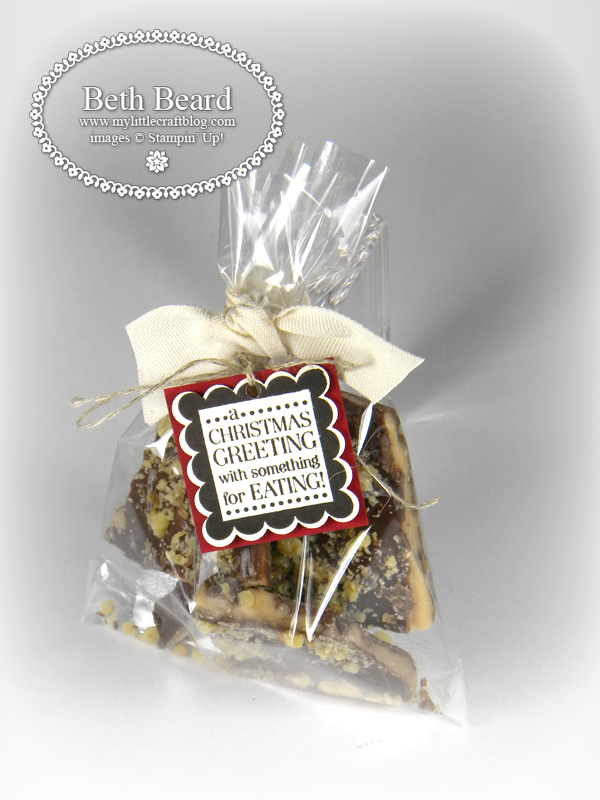 Beautiful packaging,Beth....thank you for sharing the recipe! We are having wet and overcast weather right now so not the time to get the candy to set, but will definitely try at a later date!